The new fa-115 pack offers great Fender sound and tremendous value to anyone looking to get their musical journey started on the right Foot. 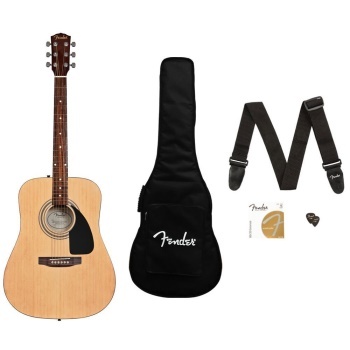 This pack includes a rich-sounding fa-115 dreadnought acoustic guitar, along with picks, a strap, a spare pack of strings and a free 30-day tribal of Fender play with access to hundreds of online lessons-everything you need to start playing instantly. The fa-115 is equipped with plenty of player-oriented features including a spruce top with "x"-bracing for full and resonant sound, smooth-playing 20-fret fingerboard and a tone-enhancing bridge with compensated saddle. Its quality construction and fine appointments make the fa-115 a guitar that sets itself apart from the pack and is sure to impress.